1. A protective case, cover, or structure, such as a plant bud, in which an organism remains dormant for the winter. Hibernacula is a permanent installation on the Sentier d'art 3 at Parc Bois-de-belle-Rivière in Mirabel, QC. The piece was commissioned by the Musée d'art contemporain des Laurentides in St-Jérôme, QC. In the summer of 2016, Matt Shane and Jim Holyoak transformed a cabin into a hub of refuge for local fauna. Several birdhouses are mounted around the cabin for chickadees, swallows, wood ducks, woodpeckers and squirrels. Using wood-burning tools, Holyoak and Shane additionally spent a month ‘tattooing’ the cabin’s interior. 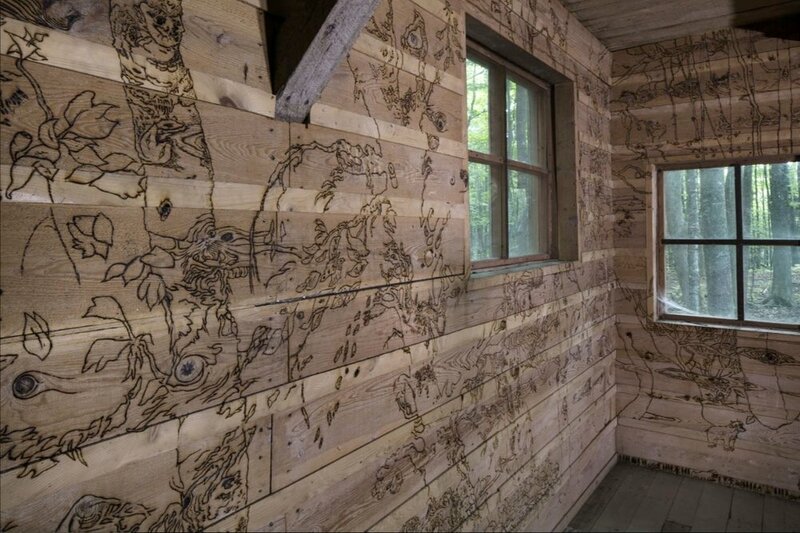 Their pyrographic drawings merge into the natural grain and texture of the hemlock walls. Tree trunks, leaves and branches are drawn from the view through the windows. Spiders are born out of wooden knots. Built settlements sprawl and fly away from multiple vanishing points. The artists invite visitors to explore their shared world by the light of day or by flashlight at night, and to rest under a flock of slumbering birds.